THE IPAD HAS DOOMED Apple, according to market anlaysts [sic] that are expecting the tablet to spell trouble for its maker. … Rather than killing off the netbook, the Ipad [sic] is harming sales of the Ipod [sic] and Macbooks… if the analysts are right the Ipad [sic] has killed the Ipod [sic] Touch. The laptop has a real keyboard and full applications. Nothing not full-featured can ever kill it, but only replace it for a subset of users who don’t need the richer experience and applications. Even if it was killing the other business outright, which it isn’t, it’s always better to eat your own lunch than wait for a competitor to do it. And the fourth reason it’s silly? Let’s be very clear: The iPad has sold 1 million units in its first 28 days. At $500-700 a pop, that means the iPad is becoming a new billion-dollar business in two months. Nick, I don’t think “regret” is the word you’re looking for. This is the VC++ team’s overview, side by side with the previous release. Includes handy links to the C++ committee paper numbers. See also Scott Meyers’ C++0x feature availability tracker for gcc and VC++, which is fairly up to date although it primarily represents the compiler versions and features that Scott has exercised personally, not necessarily the latest compiler or all features that are actually supported. Here’s a good example why I often like Ars reviews better than those at other “gizmo” sites (you know who you are). 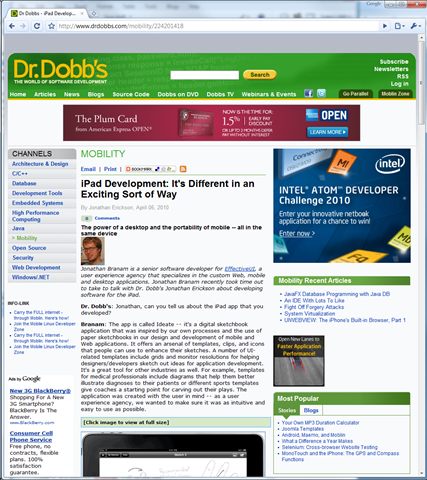 Whereas lots of other sites climbed over each other to be the first to breathlessly post reviews based on using the iPad simulator rather than having real hardware in hand and actually using the device they’re reviewing, Ars waited until their reviewers could report based on actually using the device personally. What a refreshing idea! Of course, to make it a no-brainer purchase for me, it still needs a stylus and OneNote. I’m in love. This is my favorite computer ever. I so want one. Swaine gets it. 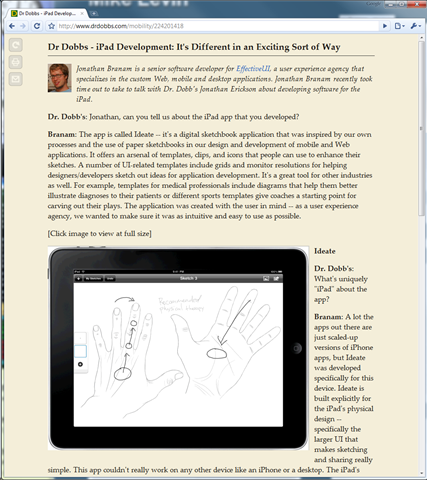 The iPad is a “read-mostly” and “anywhere” device. That’s why Steve Jobs is correct that this segment between notebooks and phones exists, and that serving that segment expands the market rather than competing directly with either neighboring segment. The tablet, spelled with “i” or otherwise, mostly doesn’t compete with desktops and notebooks (except for users who only do read-mostly stuff) or smartphones (except for users who need a bigger screen); it complements both. I’ve been using Windows convertible tablets off and on for years for this part of my computing life. For my tablet needs, the iPad as launched had only two disappointments. The killer piece of missing software was a OneNote equivalent, and the killer piece of missing hardware was a stylus – really, because I want to finally have a real paper-notebook replacement. My convertible tablet/notebook has these covered, but maybe if a dedicated tablet can match this part too it can take over the “tablet segment” for me and I can go back to a notebook that’s a dedicated notebook. We’ll see.